Traditions Cabinetry is an award-winning company. 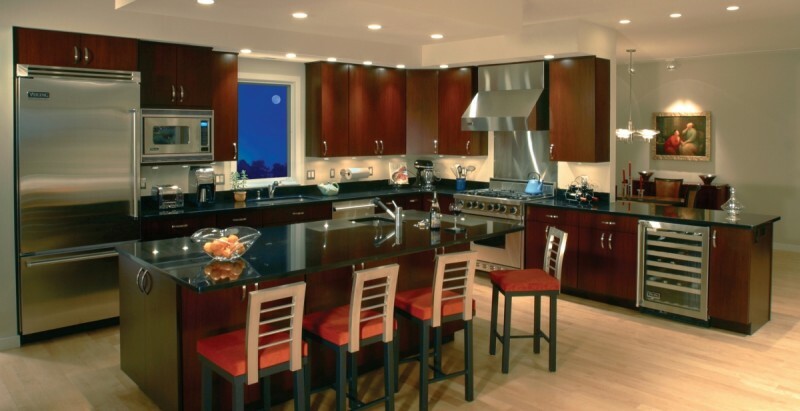 We proudly offer custom kitchen cabinets in Largo, Seminole, and Tampa Bay Areas. Most of our photos show kitchen cabinets that are built using all wood construction. We also offer cabinets with particle board construction which is referred to as engineered wood, composite wood, and furniture board. However, we recommend using all wood construction for most of our customers. Our gallery includes kitchens with painted finishes as well as stained finishes. Our painted finishes include a wide variety of standard colors, along with the option to choose from any color in the Sherwin Williams color deck! We offer several wood species such as Maple, Cherry, Alder, Hickory, Oak, Walnut, and even Bamboo. Door styles abound. We have many different raised panel, flat panel, and slab doors for you to choose from. This includes the very popular Shaker style and many transitional variations of the Shaker style. When you combine all of the finish colors and doors styles, there are literally thousands of combinations to choose from. Many of our kitchens also feature glazing. Glazing highlights the finish, and makes the finish richer in appearance. Most of our kitchen designs utilize solid hardwood drawer boxes with dovetail joints, soft close drawer slides, and soft close doors. Other options that add to the functionality are: Waste Basket pullouts, Lazy Susans, Lazy Charley’s, roll out trays (pull outs), glass inserts in the doors, utensil dividers, cutlery dividers, spice racks, tray dividers, and a wide range of other accessories. Please enjoy our gallery of Kitchen cabinetry photos. Most of these projects were installed in our clients’ homes throughout our Tampa Bay service area. This includes Pinellas County, the western portion of Hillsborough, and southern Pasco Counties. More specifically, our service area includes Belleair, Belleair Bluffs, Clearwater, Safety Harbor, Palm Harbor, Oldsmar, and Dunedin. It also includes Pinellas Park, Gulfport, Tarpon Springs, Odessa, New Port Richey, and Holiday. We also go across the bay to Tampa, Hyde Park, Westshore, Davis Islands, Carrollwood, Avila, Westchase, and Harbor Island. Our service area also includes the Gulf Beach communities of Tierra Verde, St. Pete Beach, Treasure Island, Madeira Beach, Redington Beach, Indian Shores, Indian Rocks Beach, Belleair Beach, Sand Key, and Clearwater Beach.